When we surf the web, we usually find lots of interesting news and information. This, in turn, allows us to acquire more knowledge. We can learn about a variety of topics and even life as a whole. We get to learn new quotes as well as new facts about the world. The thing is we can’t really retain all of this information especially when our focus is on something else. Fortunately, there’s a way for you to easily create snippets of almost anything that you’ve learned while surfing the web. There are web apps and extensions that can help you do that. One good example is Nuggets for Chrome. By creating snippets, you can easily save and review the facts and tidbits that you learned online. It’s highly useful when you’re studying or doing a research for work. 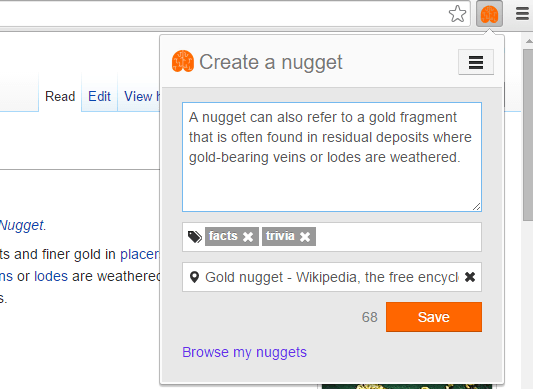 If you want to create web snippets with reminders in Chrome, you must first download and install  the “Nuggets” extension to your browser. 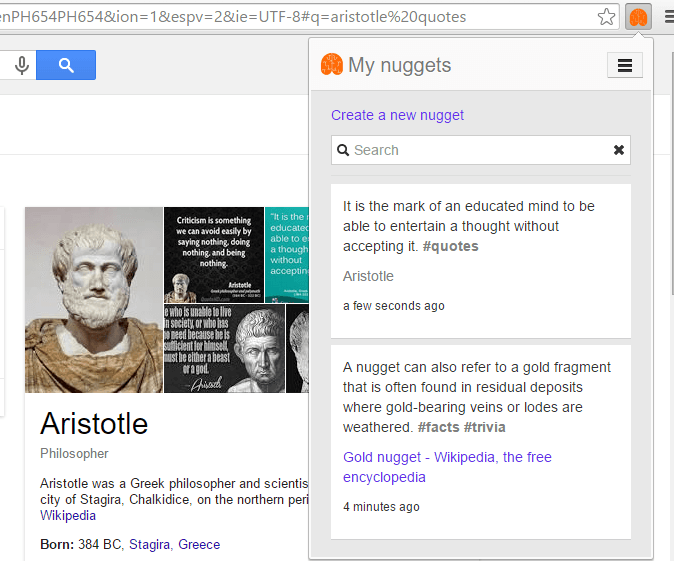 After installing Nuggets, click the newly added orange brain icon on your Chrome toolbar and then create a new account. After creating an account, you’re all set to get started. To create a snippet or nugget, you basically have two options. You can type it out or simply copy and paste it from any web page or post. If you want to type it, simply click the orange Nuggets icon first and then type out the info that you learned in 200 characters or less. Add related tags and source and then click “Save” to confirm. For the second option, just load the web page or post first and then highlight the text that you want to save as snippet. Remember, it should be 200 characters or less. After which, right-click your selection and on the menu that appears, select “Add to Nuggets”. Wait for the confirmation dialog to appear and you’re done. To browse and review all of your saved snippets, just click the Nuggets icon again and then select “Browse my nuggets”. All of your saved snippets will be shown on the popup window. You can just scroll down or use the search tool to find a particular snippet. That’s it. You may update or delete a snippet whenever you like. You will also get a daily email reminder of all your saved snippets. So the more you view and read them, the more you won’t forget. The reminders will be sent to the email that you used to sign up for Nuggets.